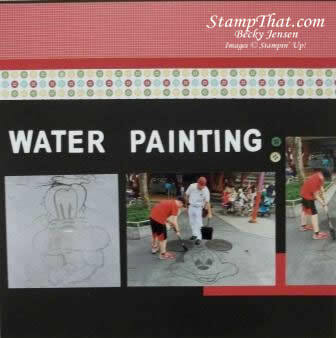 Have you ever seen the artists at Magic Kingdom who paint on the sidewalks with water? When we visited in 2017 I saw traces of their work that was evaporating away. 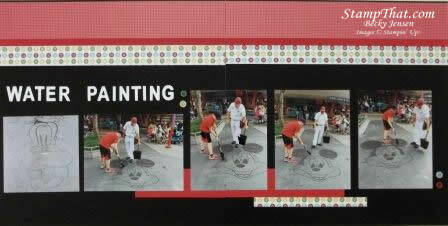 When we were there a few months ago, we saw one of the painters in action! 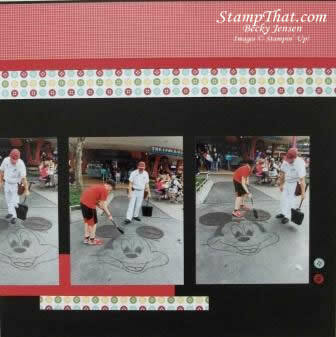 The gentleman uses a broom and dustpan (with water in it) to paint Disney Characters on the sidewalk! He had painted the outline of several characters, including Mickey, and allowed Ethan to help him color in the face! As you might imagine, Mom had to take pictures! And of course there were enough pictures to warrant their own scrapbook layout. Who ever heard of taking just one or two pictures?! We will be making this simple layout in Scrap Club this month. Although my pictures are Disney themed, the page is pretty generic so it can be used for just about any picture worthy occasion. I hope you will consider joining us for this class! Monday, February 11, 1:00 OR 6:30 P.M.
Tuesday, February 19, 1:00 OR 6:30 P.M.
Thursday, February 28, 1:00 OR 6:30 P.M.